A company has been fined £110,000 after a worker was killed when a crane wheel he was dismantling "exploded like a bomb". 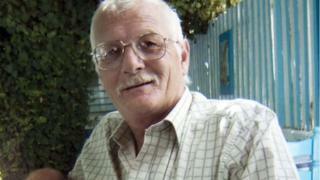 Kenneth Cooke, 62, died while using cutting equipment to separate a split rim wheel while the tyre was inflated. Denbigh-based Sanders Machinery Ltd and director David Sanders were convicted of health and safety breaches an earlier hearing. Sanders, 70, was also fined £40,000 at Mold Crown Court. The company and Sanders denied failing to ensure Mr Cooke's safety in March 2011 but were found guilty after a trial last month. On Tuesday, Judge Rhys Rowlands said it was an accident waiting to happen. "The offences are particularly grave because the serious consequences that followed were so obvious," he said. "You fell very far short of the standard required of you." He added it was "an entirely avoidable accident". Judge Rowlands said Sanders was sentenced on the basis of "sheer ignorance" because he was not aware of health and safety guidelines. He told the court, Sanders knew "precious little" about what was required of him to ensure the safety of his employees. Judge Rowlands said he was unimpressed by photographs showing the yard in pristine condition, which he said was not a reflection of its condition when Mr Cooke died. The court was told pictures taken at the time of the incident showed a number of clear dangerous practices. He added Sanders had failed to supervise Mr Cooke separating the rim and tyre. Mr John O'Byrne QC, defending, said Sanders was remorseful. After the hearing, Emlyn Jones, Denbighshire council's public protection manager, said employers had a duty to secure the health and safety of their staff. "Mr Sanders' actions and his disregard of his health and safety duties resulted in this tragic event and the council had a duty to take court action against Mr Sanders and his company," he added. "The fines today send out an extremely strong message that breaches of health and safety laws will not be tolerated".